There is an old saying, "Switzerland doesn't have an army, it is an army." Nearly every eligible Swiss Male serves in the Swiss Army as a regular, or reservist until he is 40. Each one of these soldiers is issued a rifle and two sealed boxes of ammo to take home with him. The goal: complete mobilization of Switzerland with 48 hours. Indeed many feel, complete mobilization can occur with one afternoon. The Swiss take their independence very seriously and believe the key to maintaining their independence is making the prospect of invading Switzerland so horrific that none will attempt it. Close observation of the Swiss countryside, will reveal mined bridges, hidden artillery, bomb shelters, and carefully prepared kill zones. In addition, patrols of Swiss Rifleman scour the countryside, familiarizing themselves with every inch of the land, they hope they never have to defend. The Swiss Rifleman has always been well armed. The Model 1869 Swiss Vetterli was the first repeating rifle to be adopted by any army as it's standard round. The Schmidt-Rubin series of rifles are some of the most accurate standard issue military rifles ever produced. Similarly, Stgw.57 is perhaps the most accurate battle-rifle ever produced. Combined with the accuracy of the rifles, Switzerland is a nation of shooter. Annual shooting contest attract over 200,00 competitors. All of whom shoot at target 300 meters away. It was partially due to the enjoyment of long range shooting the slowed the replacement of the GP11 7.5x55 cartridge with a more modern 5 mm round. Earlier 5.56 NATO round were shorter range rounds, and not especially accurate out to 300m. Yet, NATOs adoption of the SS109 cartridge, with it's heavier barrel and longer range, finally cleared the way for the Swiss to announce the adoption the 5.6 GP90 round (functionally identical to the SS109 round) in 1983. The SIG SG 540 dispensed with the complex roller lock action, and instead used the simpler, yet robust rotating bolt action made famous by the AK series of rifles. However, the gas system was improved by adding an adjustable gas regulator. Other production shortcuts, such as stampings and casting were employed to further reduce the cost of the rifle. The SG 540 could be equipped to fire either in full auto mode, or three shot burst. However, converting between the two required switching out certain fire control components. The SG 540 also featured a folding bipod, H&K style drum rear sight, and the ability to use a wide variety of accessories such as telescopic sights and bayonets. The SG 540 was a moderate success. 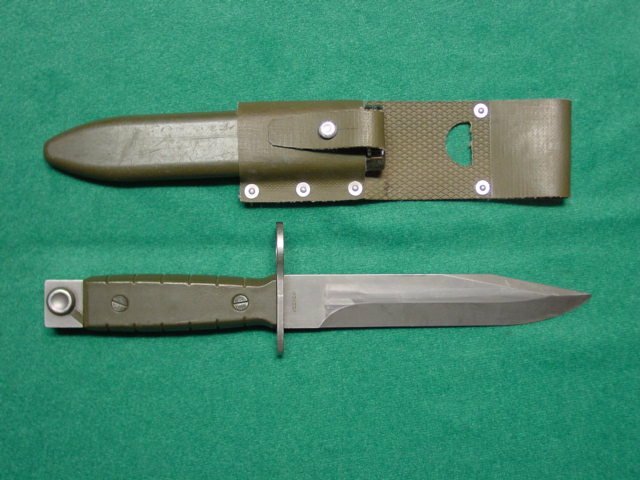 It was manufactured under license by the French company Manurhin for the French army. In addition, SG 540s have been to to 17 other armies throughout the world. In 1979, SIG produced a modified SIG 540 for weapon trials. The rifle, designated the SG 541, was produced in two barrel lengths, was equipped with a synthetic skeleton buttstock, possessed an integral bipod, and a modified selector/safety switch. 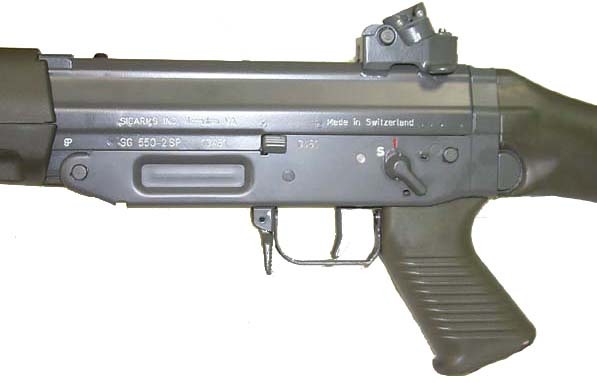 In 1983, the SG 541 was adopted by the Swiss Government to replace the Stgw.57. However, funding difficulties delayed the final acceptance. A carbine version, the SG 543 was also produced. As was the SG 542, which was chambered for the 7.62 NATO round. Overall Length : 39.3" 32.5" 28.7"
Barrel Length: 20.8" 16.0" 8.9"
By 1984, the SG 541 had evolved into the SG 550. 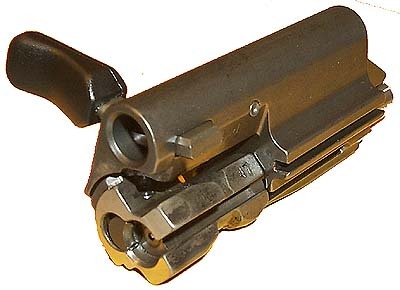 The previously optional three round burst feature, was now incorporated into the fire control mechanism, which now allowed, single, three-round burst, and full automatic capability. In addition, the gas system was improved and the folding buttstock now incorporated the distinctive void. Adopted by the Swiss Army in 1984, the SG 550 was redesigned as the Stg.90 (Sturmgewehre 90.) An initial order for 600,000 Stg.90s was made, and the first deliveries began in 1986. The Stg.90 is certainly a feature laden rifle. It incorporates a fire control system with an ambidextrous selector switch and is capable of firing single shots, three round bursts, and fully automatic fire. It possesses flip up tritium glow-in-the-dark night sights. The sights are mounted low, allowing the shooter to hold his head lower when aiming the rifle, thus affording greater cover against return fire. In addition, the Stg.90 also has provision for mounting a wide variety of scope and optical sights. The Stg.90s folding stock tends to be rigid and easy to operate. Nor is the rifles balance effected by having the stock folded. The buttplate has a rubber pad to firmly seat the rifle on the shoulder. The pistol grip is hollow, to allow the carrying of a cleaning kit. 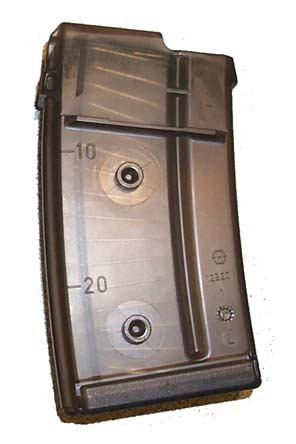 The magazines are transparent, allowing for easy checking of ammunition, and the magazines can be clipped together for convenience of carry. The forearm accepts the mounting of a 40mm Grenade Launcher. The Stg.90 is also equipped with an integral bipod. The Stg.90 is well suited the service in Switzerland. The trigger guard folds to the side, to allow firing by mitten wearing soldiers. In addition the internal of the rifle are well shielded against elements. During the trials the Swiss subjected the Stg.90 to rain, sand, dust, and temperature trials. The Stg.90 met all these trial to the satisfaction of the Swiss. For more details click here. It has been reported that some of the early production Stg.90 had problems with corrosion of the gas tubes, but that problem appears to have been resolved. In addition to a standard length rifle, the Swiss also required a shortened rifle for the use of the "Headquarters Staff." The SIG 551 is mechanically identical to the Stg.90, except for it's shorter length and omission of the bayonet. A variation, the SIG SG 551-1P, was specifically designed for Law Enforcement use, and comes equipped with a Hensholt 6x42 scope. A second variation the SG 550-LB mounts a slightly longer flash-hider and is capable of firing Grenades. The SIG SG 552 Commando is a still shorter variation of the SG 550 series. The SG 552 has a 8.9 inch barrel, and utilizes a different flash suppresser. Designed specifically for Law Enforcement units, the SG 550 Sniper model uses many of the Stg.90s basic components, but also incorporates numerous improvements. Most notably, the 26 inch heavy barrel. Also, the bipod, the buttstock and pistol grip are all highly adjustable. The SG 550 Sniper Rifle lacks the selective fire capability of the Stg.90, but is equipped with a refined two stage trigger. Also, the SG 550 Sniper Rifle lacks fixed sights, but is equipped a removable scope mount. The Stg.90 is quite an accurate rifle. At Swiss Shooting Festivals, the Stg.90 has largely supplanted many of the older models, and is quite competitive at 300 meters. Indeed, according to the SIG Swiss web site, over 30,000 Swiss Shooters have purchased the Stg.90 as their own personal target rifle. From a nation of shooters, that is truly high praise. We hope to have been of service with this information. It will be curious to see what the future holds for Swiss Rifles. Capital City Firearms - They are selling SIG 550s, as well as SIG 550 Armorer's Kits, 550 Sniper parts kits, and SIG 552 conversion kits.